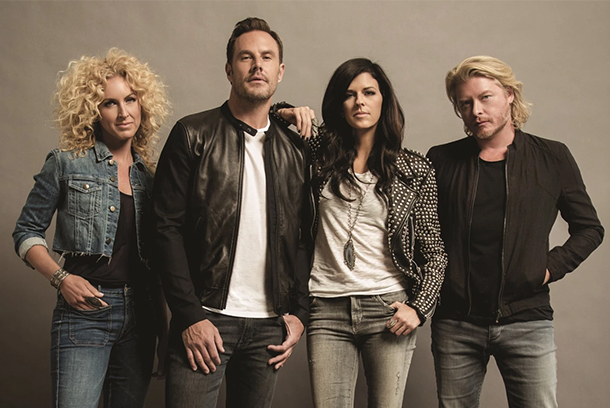 Little Big Town (pictured) soars on the back of the Grammy Awards to #1 with "Girl Crush" while Sam Hunt and Chris Stapleton both place three songs in the Top 30! As one might expect with a major music award show broadcasting last week (The Grammy Awards), the digital sales chart's are reflected this week by that fact. The biggest winner? Little Big Town's "Girl Crush" which jumps from #38 to #1 with nearly an 800% sales increase. The song, which one the Grammy for Best Country Song and Best Country Vocal Performace, earned the position via their show performance slot. Thomas Rhett's "Die A Happy Man" lands at #2 after weeks at #1 while Carrie Undewood's "Heartbeat" jumps up to #3 from #11 (a 133% sales increase) to have now sold 221k copies to date (She performed it on the Grammy's with Sam Hunt). Maren Morris' breakout hit "My Church" is at #4 and has now scanned 145k o date while Cole Swindell's fast-selling hit which honors his father, "You Should Be Here," rounds out the Top 5. Sam Hunt lays claim to two of the Top 10's slots, with "Break Up In A Small Town" and "Take Your Time" at #6 and #7. "Take Your Time" jumps thanks to the Grammy duet mash-up with Carrie Underwood ("Heartbeat"). At #8 is Brett Eldredge with "Drunk On Your Love" while the recent chart-topping duet, "Home Alone Tonight" from Luke Bryan and LBT's Karen Fairchild is at #9. Rounding out the Top 10 is Tim McGraw, again, with the stellar ballad "Humble And Kind." Chris Stapleton places three songs inside the Top 30 ("Nobody To Blame" sits at #11, "Tennessee Whiskey" is at #13 while "What Are You Listening To?" sits at #27). Kelsea Ballerini's "Dibs" hits #1 on the radio airplay chart this week with sales also surpassing 300k. She's the first new female artist in a 15 years (!) to get two #1s out of her first two hits at country radio. The last? Jamie O'Neal ("There Is No Arizona" and "When I Think About Angels"). Granger Smith's "Backroad Song" hit #1 last week on the radio airplay chart. Meanwhile Old Dominion's "Snapback" crosses the 100k scanned mark while singles from Jon Pardi, Rascal Flatts, and Randy Houser continue to rise. Dan+Shay "From The Ground Up"